A special ceremony commemorating the 100th anniversary of the end of World War I will be held at the site of the future Orange County Veterans Memorial on Monday, Nov. 12, at 11 a.m. Orange County Commissioner Barry Jacobs will be the guest speaker. The memorial site is located at Southern Human Services Complex, 2501 Homestead Drive, Chapel Hill. Veterans and families of veterans are invited to attend the special ceremony. We are starting Phase II very soon. This is the work around the flagpole are and walls. Have you ordered your brick paver yet? They are 4×8 and 8×8″ and cost just $100 and $200, respectively. 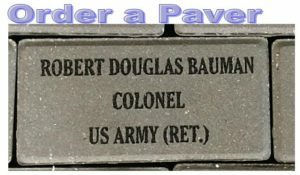 The 4-inch paver allows three lines of engraving, while the 8-inch paver has up to six lines of personalized engraving. Phase II pavers will be prominently displayed around the flagpole.